Most questions can be answered by reading through this Time Timer watch PLUS Support below. Please read this support page carefully before you contact your (school) supplier. Thank you in advance. All Time Timer products have a warranty of 1 year from date of purchase. If you believe that the problem with your Time Timer is cover by the warranty, we request you to contact your (school) supplier. Their contact details will be mentioned on your invoice. 2) Press ‘SET’ and hold for 3 seconds. 3) Press -/+ to set the hour. 4) Press ‘NEXT’ to confirm setting. 5) Repeat steps 2) and 3) to set minutes/seconds/12 or 24-hrs clock/AM-PM. 6) Press ‘SET’ to exit set-mode. 1) Press ‘MODE’ to select the Timer. 3) Press -/+ to set the requested time. 5) Repeat steps 3) and 4) to set minutes/seconds/audible alert/vibrate alert/audible alert & vibrate alert/no alert signals/repeat/original or custom. 7) Press ‘START/STOP’ to start and/or stop the Timer. 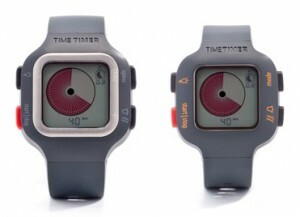 In Standard mode the watch can be set between 0 and 60 minutes. The full red disk indicates 60 minutes. In Custom mode the watch can be set between 0 minutes and 99 hours. The full red disc indicates the total time that is set. 1) Press ‘MODE’ to select the alarm mode. 5) Repeat steps 3) and 4) to set minutes/seconds/AM-PM/audible alert/vibrate alert/audible alert & vibrate alert/no alert. 3) Press ‘MODE’ until the ‘ – ‘ (minus)sign above the timer icon blinks. 4) Press ‘NEXT’ to activiate the repeat function. 5) Press ‘SET’ to exit set-mode. 3) Press ‘MODE’ until the repeat sign (arrow) above the timer icon blinks. 4) Press ‘NEXT’ to deactiviate the repeat function. The battery has to be replaced when there is no light or the watch has a dim display. We recommend replacing the battery by a jeweller. Battery: type CR2032.